Price: Free to play, option to buy in-game cash. We are all familiar with the revolution of Facebook and gaming, especially with a little well known game called Farmville. 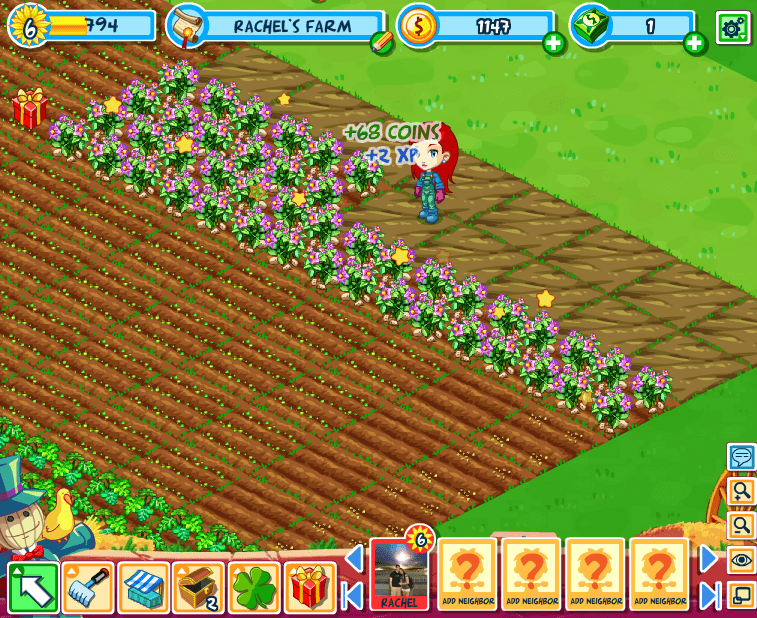 One farm themed game may knock Zynga’s Farmville off its pedestal though: Gameloft’s Green Farm. 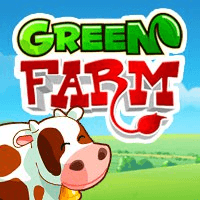 One of the major concept differences between Gameloft’s Green Farm and Farmville is the addition of environmentally friendly organic crops and the use of windmills on buildings (hence the name Green Farm). The organic crops are more expensive, but yield more money and provide seeds that you can replant. I worked on an organic farm over the summer and this concept is true in real life as well. While you may think “wouldn’t non-organic crops provide seeds also?” you would be correct, but many companies have this weird policy where they do not allow their contracted farmers to reuse seeds, and instead buy new seeds from the company for each season. Crazy, right? 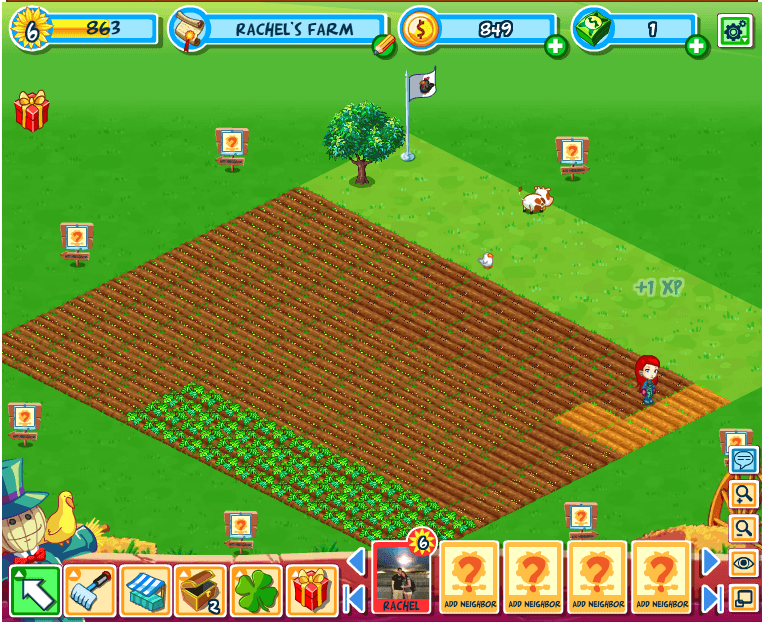 The concept of Green Farm is not unlike Farmville’s at all. You have a farm, you click on plots to plow, then to seed, then you wait a length of time to harvest. You can buy chickens and trees, and customize your avatar. It is essentially Farmville, just with better graphics and a few different concepts thrown in. If you are one of the few that have held out on the constant urge to see what Farmville is about, the gameplay in Green Farm is pretty simple: you have a farm, you click on plots to plow, then to seed, then you wait a length of time to harvest. Sarcasm aside, it is a game I like to call a “background game.” Whenever you choose and plant a vegetable crop, there is a predetermined amount of time until it harvests. It can be anywhere from ten minutes to several days. You keep in mind about when you have a harvest due, or keep it running in the background while you do some work or whatever else you want to do (like I am doing right now). I do appreciate some of the improvements over Farmville though like a more customizable avatar, and they gave you the ability to even name your animals. My chicken is named Cutie Patootie right now. Oh, and your animals? They actually grow from being a baby to an adult. I have yet to find out if they die of old age, but I will let you know. You feed them as they get older, and eventually you have the option to collect from them, or else you can sell them. You can pet them too, isn’t that sweet? There are still pop-ups letting me know that I don’t have any friends who play Green Farm, and I hate spamming friends with neighbor requests. When you do have neighbors though, there is a lot more social interaction than most social network games. You have the ability to see if your friend is also on their farm in real time and even have a chat with them (I guess in case you have yet to discover the chat feature on Facebook). You also receive the normal “help out!” prompt, but it is also a bit more interactive. Instead of just clicking yes and immediately receiving your reward, you actually have to scare off the bear or do whatever else your neighbor needs help with. You can also pet the animals for extra rewards, and the animals are pretty cute. So pet them. Gameloft also included achievements in Green Farm. For instance, I received level 1 for the achievement “Big Spender” today. I have never really cared about achievements in games, so I don’t really care again here. Not to say that achievements are bad, I am just too lazy to go above and beyond in most of my games to receive them. Like Farmville and other Facebook games, there is the ability to buy in-game cash. While I don’t mind there being the option, my biggest disappointment is that most animals require this in-game cash to buy. I am used to having unlimited amounts of chickens to buy, but you still have the option of winning them from the daily lottery. Oh, and there is a daily lottery. It is as simple as it sounds. 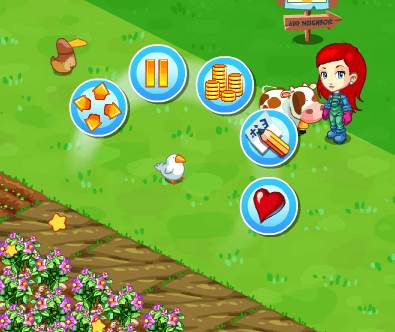 You receive three credits a day to try to win items like some seeds, an animal, or some money. Overall, the gameplay and features are not especially original, they just work better than they do on Farmville. When I was told to review Green Farm, my first thought was “this game is never going to load.” Farmville is stupidly laggy on my older laptop, especially after they began adding all of the “extra” stuff, and having in game popups reminding you that you don’t have other friends who play Farmville (or was that just me?). Well lo and behold, Green Farm loaded like a dream, and it even plays like a dream. No more lag for me! Remarkably, they did not sacrifice the quality of the graphics for better loading time. In fact, the graphics are better than Farmville’s! The colors are much richer, and even have a little bit of a 3D feel. Your avatar is a little more detailed, and your animals look happy. There is a nice, joyful loop of music that is reminiscent of The Sims’ music, except one octave higher and sped up. I also have the enjoyment of hearing my duck quack and my cow moo from time to time. Whenever my crops are ready, there is a nice little pop to let me know. Green Farm is essentially a better Farmville. I hate to compare a game that way, but it is honest. There are some nice features to encourage environmentally friendly decisions, but really, they are only in a game and probably will not make a big real-world difference. All in all, there is not much innovativeness in the game play or even the design. That being said, I like Farmville, so having a better version is great to me. It is a fun game to run in the background, and another way to connect with friends on Facebook. Unless you are me, and fail at being social on a social network.